Troop 6 has a long history of participating in the Independence Day parade. We won the Mayor’s award in 2008. A young boy entering the main gate of the Idaho State Fair glanced up at the huge twelve foot man glaring at him and hastily deposited his hamburger wrapper into the yellow trash bin on which the monster sat. A sign on the monster’s perch warned visitors to stash the trash rather than convert the fairgrounds into a vast refuse dump. A second sign announced a “what is my name” contest for the monster. 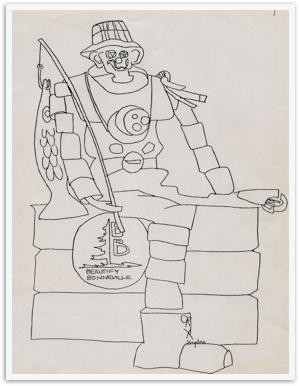 Hopefully the boy entered the adjacent Agricultural Hall and walked to the Bureau of Land Management booth where Johnny Horizon, their genial man of the forest, smiled down from the walls of the booth and proclaimed “This is your land - Keep it clean”. The boy thought for a moment, then smiled and wrote the name “How’ie Litter” on a slip of paper and deposited it hopefully in the contest box. Outside the hall, the litter monster set broodingly greeting other visitors to the fair. He had won a blue ribbon for Troop 6, BSA, Idaho Falls, his maker, in the two mile long parade through the city of Blackfoot at the start of the fair but that had not been easy. His handlers had not scouted the parade route thoroughly and the monster had an unpleasant encounter with a low sagging tree limb. One of the Boy Scouts, accompanying the monster as an honor guard, shinnied up the monster’s body and replaced a huge fish slung from a fishing pole that was the only casualty of the bruising encounter. The Monster was already a has-been during the week he presided at the State Fair. two weeks before the fair, the monster lay in a manger in the horse barns at the Bonneville County Fair Grounds with a broken back and everyone wondered who would cart him off to the city dump. But the Beautify Bonneville Council of Idaho Falls had faith in the monster as a symbol for litter prevention and the monster gained a new lease on life. He now even had a name - “Howie Litter” * one of several hundred submitted in the contest. Howie was born for the big Idaho Falls Fourth of July parade, but Howie’s patron, the Idaho Falls Beautify Bonneville Council, had only a tiny budget on which to operate. In an area noted for the beauty and extravagance of their parade floats, the council had no money for a costly float. They turned to Idaho Falls Troop 6, one of Idaho’s oldest and largest Boy Scout troops. Scoutmasters Hurley and Webber huddled with the scouts and the anti-litter committee of the Beautify Bonneville Council and the plan for a trash monster was born. The scouts scoured the back roads and the westfields for imaginative trash and hauled their finds to a vacant corner of a construction contractor’s equipment shop. Fortuinately, the shop had a crane to lift the monster onto a trailer and Howie’s career was launched successfully. Howie’s first parade was a huge success, unmarred by any unfriendly trees. An ugly duckling in a two mile line of beautiful patriotic floats, nevertheless, he met a solid continuous ripple of approval from the parade watchers and even a nod of approval from the judges. Howie’s life seemed over when the parade was finished. Who wanted two tons of junk - even if it had a blue ribbon tied to it. Howie was dismounted from his trailer but a fall broke his back and he lay in the manger waiting for his fate to be decided. But Mayor Eddie Pedersen and his Beautify Bonneville Council were persistent and Troop 6 once more rallied to Howie’s assistance. He could not stand with his broken back, so he was to be allowed to sit for his next appearance. A Bureau of Land Management fork-lift raised Howie back onto a trailer and the scouts went to work on him so that Howie could go on to his next triumph at the State Fair. Howie’s patron, the City of Idaho Falls, has been honored as one of three cities in the U. S. to be awarded a plaque this year by the national Keep America Beautiful, Inc. and Howie can claim some part of the honor. Has his career now ended? Who knows, he may even turn up as Santa Claus.